A long-standing frustration of mine is the way the music notation package Sibelius handles the ’tilde’ sign ~ in text. As a sort of clever bodge or hack, it is used to hide midi messages, so that a control change for example can be put in the score as ‘~C64,127’, but won’t print out. 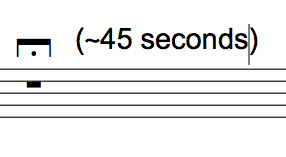 However, I’m of the frequent habit of using the ~ sign to mean ‘approximately’; I’d love to be able to mark a pause, for instance as ‘~45 seconds’, meaning roughly 45 seconds, but when you do that the text gets hidden. So, still impossible to use a ~ character in text anywhere in Sibelius without the text being hidden. How frustrating. Following some helpful remarks on the Yahoo! Sibelius group and in my blog comments, this has been cleared up a bit. The ~ character isn’t in the Arial font, but inserting it as Symbol font works fine; this seems to kind of happen automagically in Word and Pages and not Sibelius, but that’s fine and easy to fix. There’s also been a suggestion that I shouldn’t use this symbol as it wouldn’t be clear to musicians. On looking into this is discover that ~ as an abbreviation for ‘approximately’ is not as widespread as I thought it was, although for me it’s an everyday thing. Oh well; being unclear to musicians is all part of the game anyway. The reason that the character disappears when you stop editing is that it doesn't exist in the font you're using. 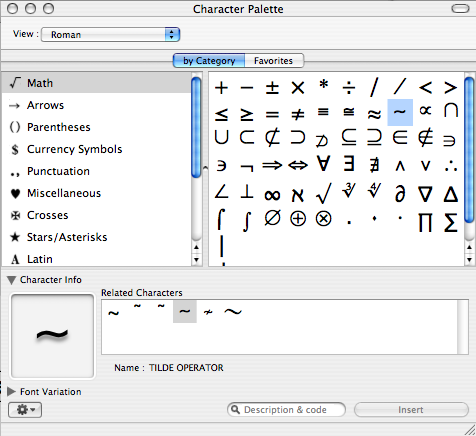 Fortunately there's an easy way around this.Go to the Font Equivalents page of the Preferences dialog, and switch on the option 'Automatically switch font to match chosen input source (in the input menu)', which will ensure that a change to the chosen font is inserted in the text along with your chosen character from Character Palette. Alternatively you could stop using sibelius… I'm seriously considering my other options. Hope the piece is going well!